Baby socks and booties come in all sorts of designs and shapes, from Mary Janes for little girls to Converse All Stars for modern infant boys and girls. One of the most important aspects of baby bootees design is that they stay on constantly kicking little feet. Here are some easy stay on knit and crochet baby booties free patterns found recently. 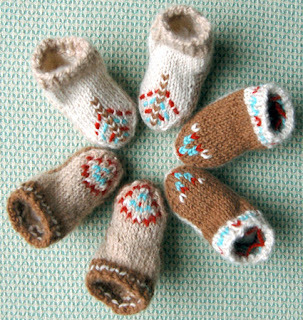 Baby Mocs at Purl Bee, the folksy online blog of Purl Soho, a knitting and craft shop in New York City I'm dying to visit. These bootees are knit with sport weight alpaca, that's 6 sts = 1 in on US size 2 and 4 needles. For a bootie larger than this 3.5 inch finished size, use a size 5 or 6 needle and a yarn with a gauge of 5 sts = 1 inch. 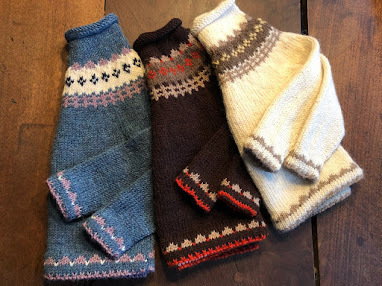 Two pairs of booties can be made from one skein of yarn and bits and pieces from your stash used for the different color Native American design. 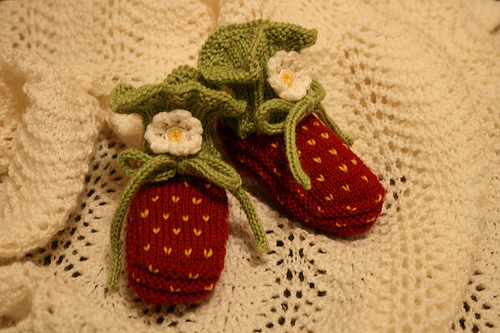 Download this free baby booties pattern. Read on for even more baby bootee patterns. Andrea Wong designed these baby booties knit with Portuguese style knitting, popular in Greece, Egypt and Brazil. In the Portuguese knitting method, the knitter holds the yarn around the "knitting pin on your left shoulder, which makes the working yarn easily available, makes tension uniform, and requires fewer movements to knit or purl, an incredible advantage for people who suffer from carpal tunnel or arthritis." Watch a video tutorial of how to knit in the Portuguese style. 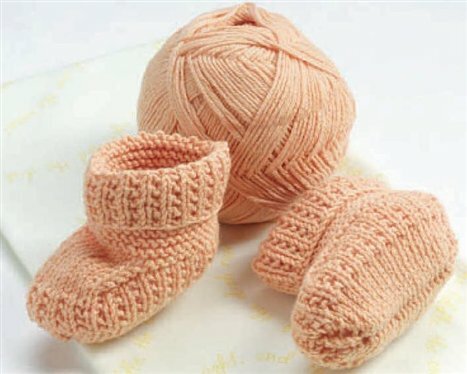 The baby booties pattern is a free download on Knitting Daily's site, where you can sign up for Kathleen's daily email and receive even more free patterns. These easy baby booties are available to knit or crochet as free patterns from Bernat - real favorites, hooked on a 4 mm crochet hook or size G or 6 and available in two sizes: 3 months or 6-12 months. All booties make great last minute gifts and are so useful for the new baby's layette collection. This is a free pattern at Bernat, blue and white bootees: knit pattern stay-on booties. 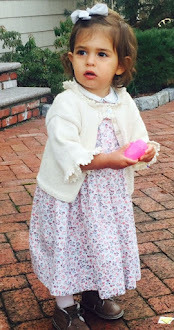 For the crochet pattern, pink and off white bootees click here. These little "Summer Booties" from Knit Possible are as cute as can be and fit a 2T toddler foot. Little spring lambs for tiny feet, crocheted with worsted weight yarn with a size 3.75mm or size F hook. This easy baby booties pattern is available as a free pattern download at knitpossible and on Ravelry.